This post is a NOTCOT Exclusive sponsored by Honda as part of their Super Civic Quest running across the internet. Odds are you either found this post like a normal NOTCOTer or found your way here through the Super Civic Quest! You found it! The hipster lumberjack and his squirrel, the ninja asian girl, the luchador, the monster, and the zombie! What do they all have in common? 2012 Honda Civics - one customized for each of them! 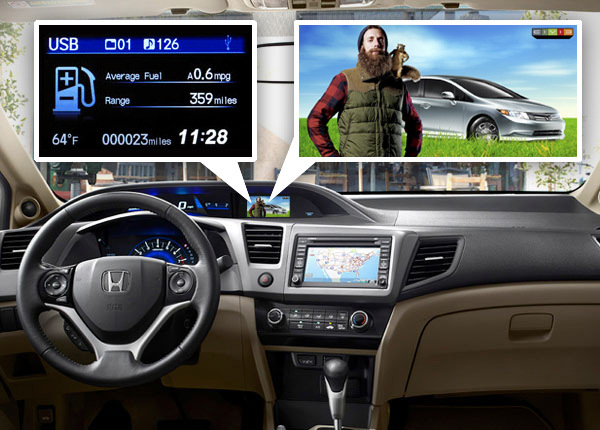 How fun is the idea that amongst all kinds of crazy new features, your car can be a super digital photo frame? Yes, you can actually set wallpapers on your car dash with the i-MID system (available on the EX model with navigation) - so instantly flip over from checking your mileage range, making phone calls, exploring your mp3 player… back to any picture of your choice! And Honda’s given us an exclusive set of wallpapers with their latest characters as part of this secret quest spread throughout the internet… Their videos crack me up too! So check out the videos and wallpapers… and maybe the clue to your next destination… on the next page! Happy hunting! WALLPAPER!!! Click image to grab the full higher res wallpaper! Nice job, Questie! For your next clue, click here!